Is there a better alternative to Doukutsu? Is Doukutsu really the best app in Arcade category? Will Doukutsu work good on macOS 10.13.4? 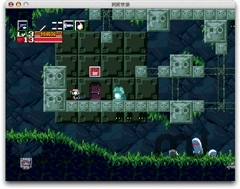 Doukutsu is a freeware sidescrolling action/adventure/platformer title with leanings towards Wonderboy and recent sidescrolling Castlevania titles. You control a little amnesiac who runs around helping out these rabbit-ish creatures called Mimigas while trying to find your way out of the giant cave inside the floating island which makes up the game's setting. English language patch available here. Doukutsu needs a rating. Be the first to rate this app and get the discussion started! You can expand your health meter by collecting Life Capsules in similar fashion to Metroid games, while you can get stronger by collecting energy to boost your firearms' output. Each weapon can be built up to the maximum level (3) fairly quickly, but taking damage will drain energy from its experience meter, sometimes causing it to level down. Given how quickly they power up this only tends to be an issue during boss fights, and even then there's usually plenty of opportunities for collecting more weapon energy.